Carex bullata.Donald Cameron.New England Wild Flower Society.gobotany.newenglandwild.org. (Accessed 4/2014). Carex bullata perennial 30-90 cm colonial from deep rhizomes, sometimes sod-forming, stems sharply 3-sided, rough above. Leaves alternate, blades 0.2-0.5 cm wide, flat, lower leaves longer than inflorescence. Flower spikes well separated, the upper 1-3 male, 2-7 cm long, female spikes 1-2, 2-5 cm long, about 1-2 cm wide, the lowest ones stalked; perigynia 0.4-0.7 cm long, shiny, yellow-green to brown, inflated, abruptly contracted to a smooth beak 0.1-0.2 cm long, teeth short, achene 3-sided, yellowish, to 0.2 cm, style persistent, hard, flexed or twisted; blooms and fruits June-Oct. Frequency in NYC: Rare (NYS S1, T). 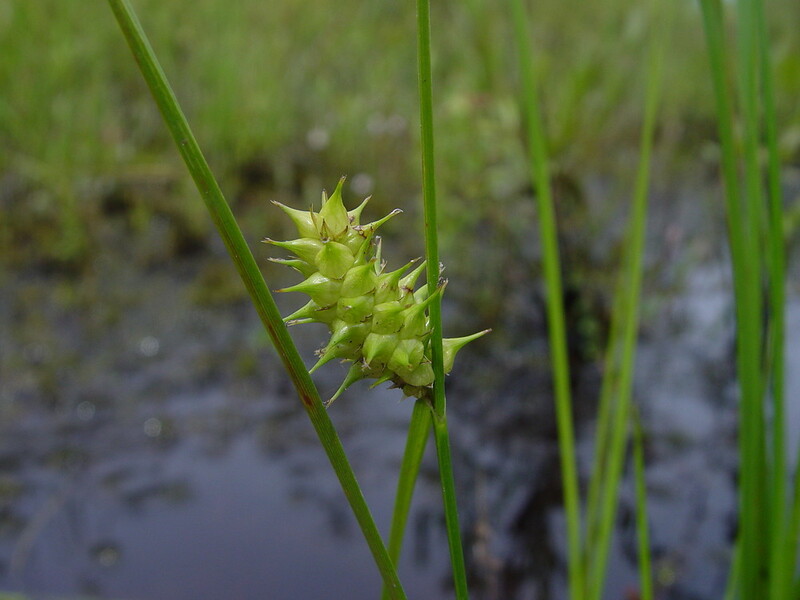 Habitat: Acid bogs of coastal plain.